If you're thinking of writing a little love note or card to your spouse this year, why not let it be postmarked with love? You can mail it to Loveland, Colorado (the "Sweetheart City")where it will be hand-stamped with a unique four line poem & pictorial postmark. The Loveland Chamber of Commerce heads up this yearly romance project with cards going to all 50 states and to over 100 foreign countries annually. 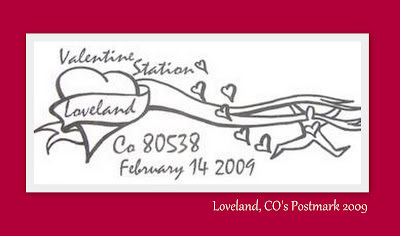 To ensure delivery by Valentine's Day, mail must be received in Loveland by February 8 (for cards being returned to US addresses). Further details here. What a fun idea. I'm thinking I may go with Valentine, NE this year since that's the state we currently reside in. This would be neat to do for my cousin's a sister's cards that I mail out - they would be so excited!! Thanks, I'm going to do this for sure! This is my hometown! Valentine's Day is always a fun time of year in Loveland. I miss it! Thanks for posting about this. I have done this with North Pole, never heard of this. Darn, I mailed out my valentines yesterday. Hey I love this post! I just shared it on my blog where I did a link share on simple valentine's day touches!